When he spies the BIG hill—make that a mountain!—in his neighborhood park, Maxwell is determined to climb all the way to the top. He has everything a true outdoorsman needs: climbing gear, a map, a first-aid kit, water, snacks, and his trusty toy soldier, Harry, by his side. But when Maxwell loses the trail, he must rely on his smarts to get back on track. 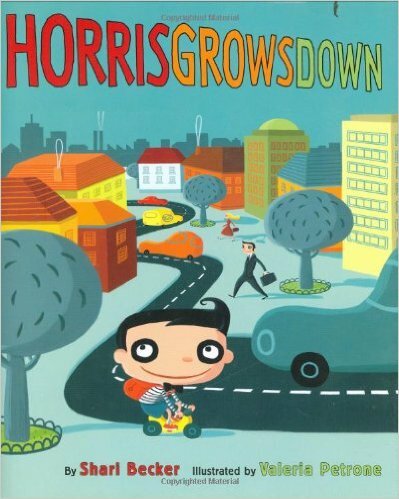 Horris is only four years old, but he already knows all about being grown up. He’s such a BIG little boy that his astounded parents decide he should get a job. So every morning he puts on a bow tie and rides his trike to the box factory where he works. Horris likes his job, but he’s not sure he’s cut out to be a grown-up. He hates coffee, he can’t use sharp knives, and he can barely count past ten. When he sees what most kids do for a living, he wonders if he should just go back to acting his age! All Rights Reserved by Shari Becker 2016.